I don’t know about you, but when I hear most of these phrases I picture a monk sitting in nature with no distractions entering a state of perfect bliss. Um, yeah, right. That sounds lovely but it’s certainly not possible for most of us. In fact, most of us are barely just getting through the day nevermind finding time to sit in silence. All is not lost though. Escaping into just a minute or two of awareness is still a good thing and easier to do than you might think. Here are five everyday moments where you can practice awareness. You can certainly choose your own five but sometimes it helps to have someone point out the obvious and I am the master of pointing out the obvious. But, if you take just a minute to slowly let yourself come into awareness and notice how you feel, how the sheets feel, the light in room, the sounds around you, it’s a much more peaceful way to wake up. Just try not to fall back asleep! 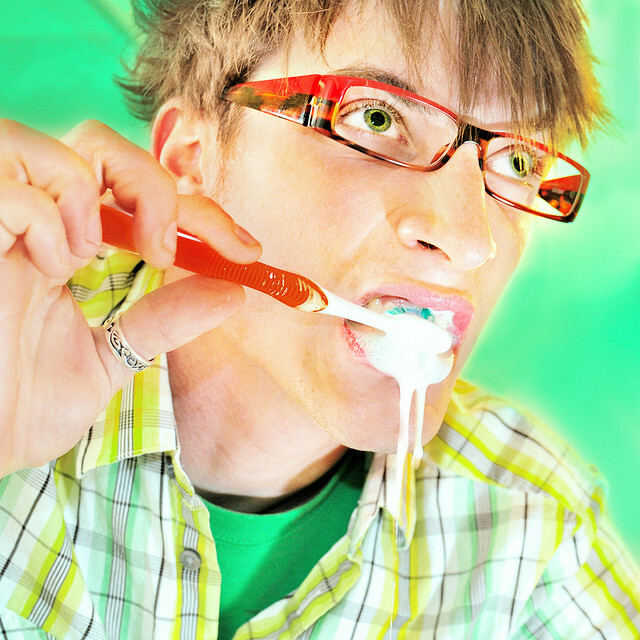 Brushing your teeth is another one of those everyday mindless tasks (well, hopefully it’s an everyday task for you) where your mind whirs about in a 1000 different directions. Pay attention to what you’re doing in this moment though and you will find it becomes a different experience. Smell the scent of the toothpaste, feel the bubbles on your tongue, experience the cool water swishing around in your mouth. Revel in the sound of your spit hitting the sink! See, who knew brushing your teeth could be so much fun AND so relaxing? This is definitely a moment when most of us are barely aware we’re eating nevermind paying attention to the sensation of eating. Slow down. Chew slowly. Taste what you’re eating. Take small bites. Smell. Taste. Swallow. Mindful eating is a great way to be present in the moment and it’s actually a good diet tool too because it gives your mind and stomach a chance to know that it’s full. Present Moment Dieting! If your high school is experience is anything like mine was, the walk to class between bells is an incredibly stressful and often anxious time. There is a crush of bodies, lots of voices, lots of smells (perhaps some not good) and pretty much just general chaos. Why not try to escape all of this by just focusing on yourself. Becomes more aware of the sounds. Notice the expressions on peoples’ faces. Smile at someone. Feel your books in your arms. Take a deep breath. You can’t completely remove yourself from the chaos but you can just sort of let yourself be carried along by it instead of fighting it and give yourself a moment of peace. Ok, if you’re anything like me when I’m trying to run your mind is going something like this, “I hate this. I think I’m getting a cramp. Am I getting a cramp? How much farther is it? I’ll stop when I get to that crack in the sidewalk. Ok, maybe I’ll go a little further. No wait, I think I’m getting a cramp.” I’m here to tell you that running and in fact any kind of exercise can be a moment to practice present moment awareness. Listen to your breathing. Become aware of your feet hitting the ground. Listen to the sounds around you. Feel the wind against your face. Be grateful that you have this incredible body capable of amazing feats. Heck, there’s even an entire website devoted to Mindful Running if you want to explore this more. See, there are lots of opportunities throughout the day to practice mindfulness or to be in the present moment. You just have to open yourself up to those moments and try it for yourself.